Takes is an iPhone app where every picture has a play button – captures pictures and video at the same time, one click to add filters, music and share on Twitter and Facebook. 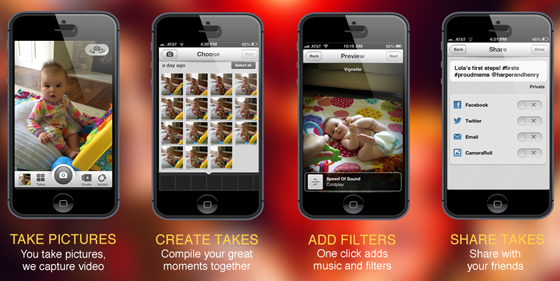 Takes™, the iPhone app that creates social videos as you take pictures, is now available in the App Store. The improved core engine results in the highest quality video available today with the easiest user experience. With no effort at all, users can compile moments of their life and tell great stories with lengths greater than 15 seconds but still optimized for sharing instantly on Twitter and Facebook. Since SXSW 2013, more than 1M Takes have been captured globally. Takes is a unique approach to social video where unlike Vine or Instagram, users don’t have to manually record video, they can take pictures and then Takes simultaneously captures the best video clip for that moment. Takes can turn anyone into a video producer and users get great videos and keep still pictures too. One click adds filters or music; another click and users are sharing their content. Takes’ new engine produces an even higher quality video than ever before. When users take a snapshot, the patent-pending technology ensures that only the very best video footage extracted from each picture is used. Takes videos are production quality, integrating each Takes into smooth and clean video. This new version has superb original audio capabilities and a fun first-time user experience, turning anyone into a master video creator. Takes has a bustling community of iPhone users who want to show off their moments and events intuitively. Takes is resonating with users who want to easily compile short social videos and share them on both Twitter and Facebook with a single button. Takes has become wildly popular at weddings, concerts, new beginnings, vacation, and celebrations. Takes™ is an iPhone app where every picture has a play button. As users snap pictures, Takes captures video too. Takes can be compiled in one click to make high quality social videos. Users can add filters or music and share their video on Facebook and Twitter. Takes is based on patent-pending technology that can be embedded in other applications and hardware.